Paper Doll Collaboration December 2018 Ugly Holiday Sweaters! 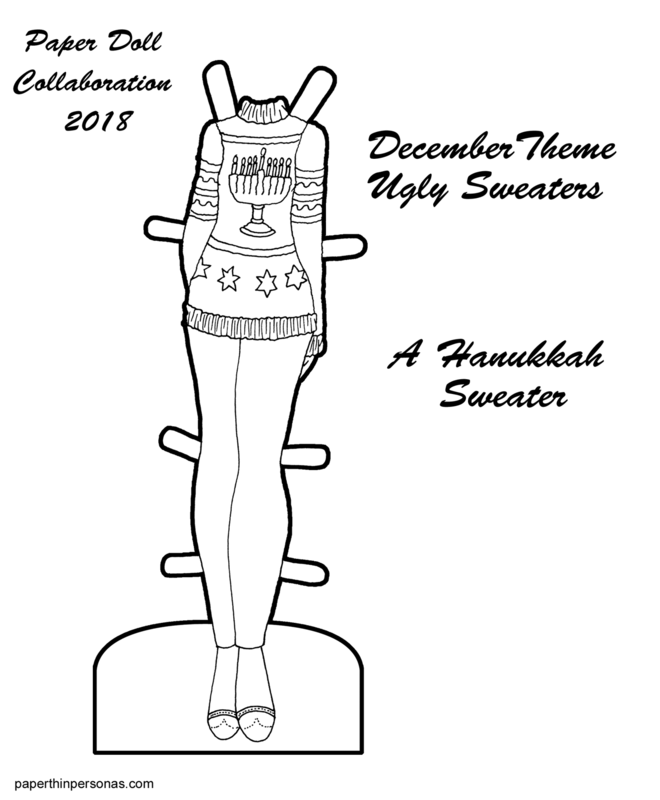 This month’s collaborative theme was Ugly Sweaters of the holiday theme. I, being Jewish, settled on an ugly Hanukkah sweater. I chose this design, but I confess I’m not sure the menorah is obviously a menorah. None the less, I had a good time designing it. This is the last Collab paper doll for 2018! And on Monday the 31st, there will be a new paper doll series debuting. I couldn’t be more excited (and nervous) about that. As usual, Paper Doll School and Miss Missy Paper Dolls also have Collaborative Paper Doll Project posts up and I can’t wait to see their ugly holiday sweaters. I love sweaters, though I don’t own any holiday sweaters. Next year, there will be another paper doll collab project. I’ll share details just as soon as me and my cohorts make some final decisions. First off, I love the poetry that came out of the war. To this day, I can quote Siegfried Sassoon and Wilfred Owen. In my teenage life, when I was full of angst, I adored Wilfred Owen. I still do, but I am no longer filled with quite so much angst. 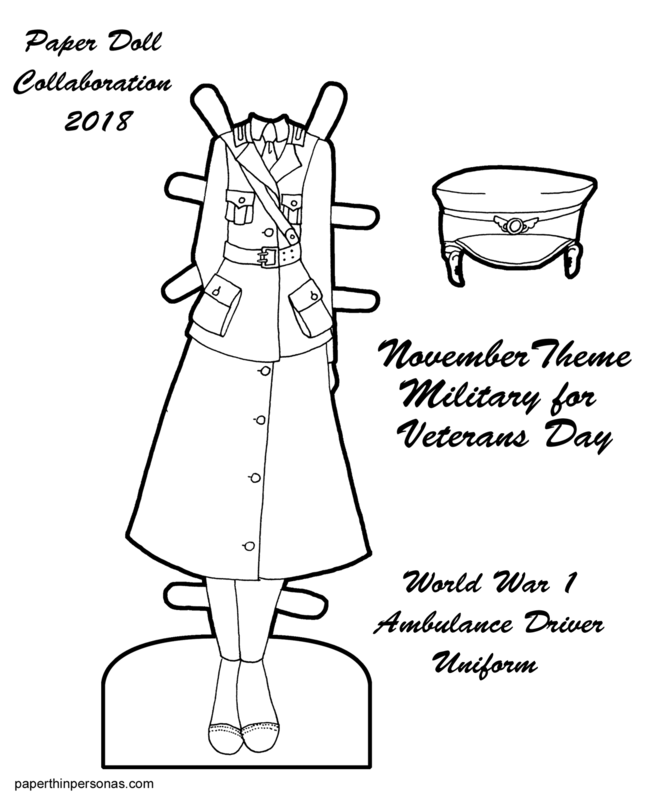 So, this is all to say that today’s paper doll outfit is based on an ambulance drivers uniform of the First World War. This design was drawn from a uniform from the Women’s Motor Corps of America which you can see here and another example here. There’s also this great photo from the Library of Congress. I was a little hesitant to use this for our military themed month, because while I though the uniform was military related when I first drew it, I have realized its not. Most of the ambulance drivers during the war were affiliated with civilian relief and welfare organizations such as the Red Cross. While nurses did serve in the Army and Navy Nursing Corps, I haven’t found much information on ambulance drivers doing the same. The Red Cross provided a great deal of the medical treatment during the war. They had female ambulance drivers, but technically they aren’t military. But by the time I figured that out, I’d already finished the paper doll set. So, I am going to go with it anyway. As always, Paper Doll School and Miss Missy Paper Dolls are my partners in crime when it comes to the Collaborative Paper Doll Project and I can’t wait to see what they came up with for this week so head over to their sites for that. October has turned into a rougher month than I expected it to be. I know Eliot argued that April was the cruelest month, but personally I have found this October to be brutal. There have been some upsides (I have been enjoying my Inktober paper doll creation), but I am pretty ready to slide into November, thank you. 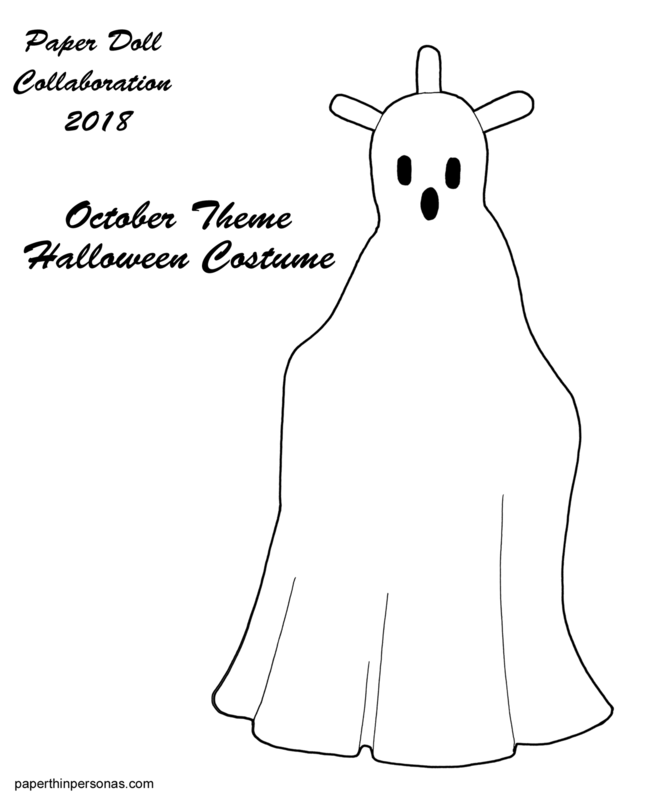 So, when it came time for the collaborative paper doll theme of Halloween costume, I had no ideas. I tried. I doodled. I looked around Pinterest. And yet… nothing came. So, in the end, I decided on the simplest, most cop-out Halloween costume I could think of- A sheet ghost! If you want to see more “Halloween costumes” (and probably some that are more… interesting than mine) head over to Paper Doll School and Miss Missy Paper Dolls. I can’t wait to see what they’ve done with this theme. Black and White Paper Doll PDF Paper Doll Collaboration 2018Let me be clear here- if I am going to sprint, it is probably because I am being chased by a wild boar or something. When I do exercise, it’s entirely because it helps my anxiety and not because I particularly enjoy the activity. 1. I don’t have a favorite sport. 2. I really don’t care about sports. Meanwhile, I had to draw something for the month of September and making a paper doll t-shirt that said- “Ugh… Sports” on it felt a little dismissive of the whole point. So, I settled on my Dad’s favorite sport- golf. 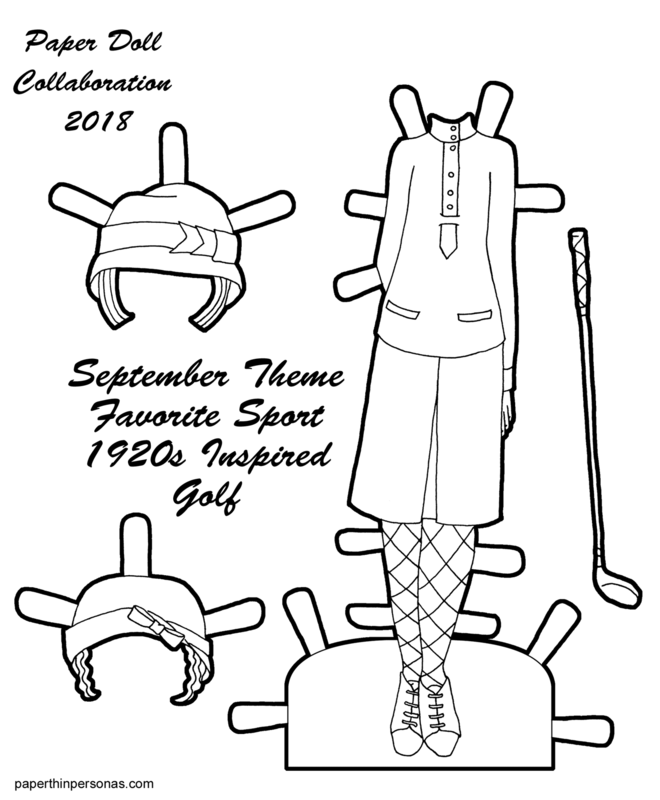 And while I still think golf is dumb, I can at least respect the fact that women have been playing golf for a really long time and there have been some super cute outfits designed for golf. Today’s paper doll dress is vaguely inspired by the 1920s. She has two hats with different styled bobs and a golf club which is probably totally inaccurate. If you want to see more “favorite sports” hop over to Paper Doll School and Miss Missy Paper Dolls. They are my partners in crime and I can’t wait to see what they’ve done with this theme. 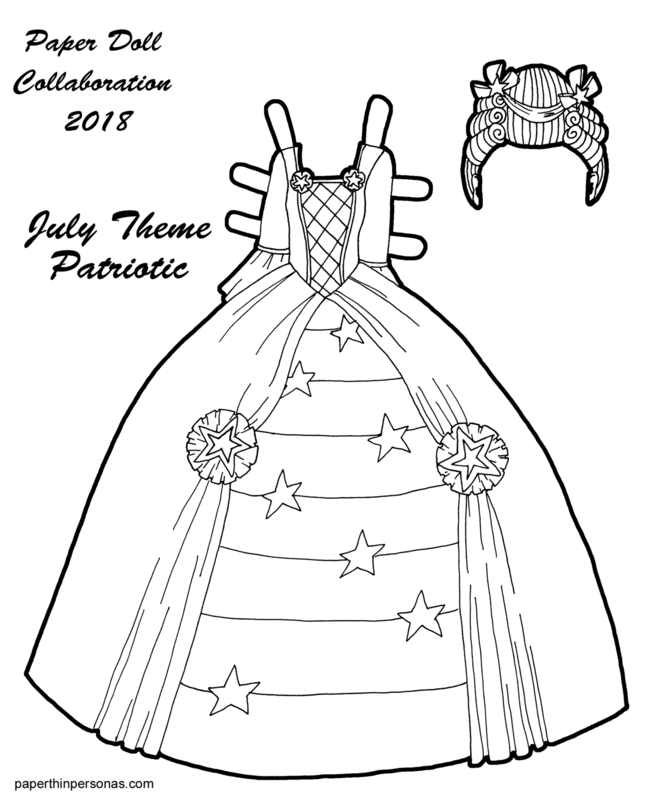 Black and White Paper Doll PDF Paper Doll Collaboration 2018For July, we chose a patriotic/colonial theme for the paper doll collaboration between Julie, Missy and I. I really love over the top roccoco inspired gowns as you may have already guessed from this paper doll and this paper doll and this paper doll and this paper doll. And that’s not even all of the ones I’ve ever drawn, it’s just a few of my favorites. So, today’s foray into the genre, I wanted something that could be patriotic (if you colored it in red, white and blue) for the July 4th Holiday in the USA, where I live. But since I know not all my readers are from the USA, I also wanted it to be a gown that could be celestial if you preferred. I think in purples, blacks and blues this gown could become something for the Queen of the Night from Mozart’s Magic Flute, for example. I could also see it in red, white, black and gold and have a circus theme. The possibilities are really endless. One the things I love about playing with color (and one of the reasons I so often do extra color schemes) is that I love how much changing the color can really dramatically change the look and feel of a single paper doll gown. I like to play with color (and I love color), so that’s a big part of why I do that. If you want to see more of the collaborative paper doll fashions, check out Paper Doll School and Miss Missy Paper Dolls my partners in this adventure. They’ve been such inspiring and good sports about the whole thing. We’re just over six months in and I couldn’t be happier at how the whole thing has gone. Despite being more than a trifle obsessed with the idea bridal trousseaux, I very rarely draw wedding dresses. I think I just have never been that into weddings. Despite living the South (which tends to give a whole new meaning to the idea of big white wedding), I just don’t really get the appeal. I’ve never been one of those girls who was planning my wedding day since age ten or something. So, when I draw wedding dresses they tend to be historical (regency or 1870s) or fantasy like this steampunk one. I don’t think I’ve ever actually drawn a contemporary wedding dress until today. 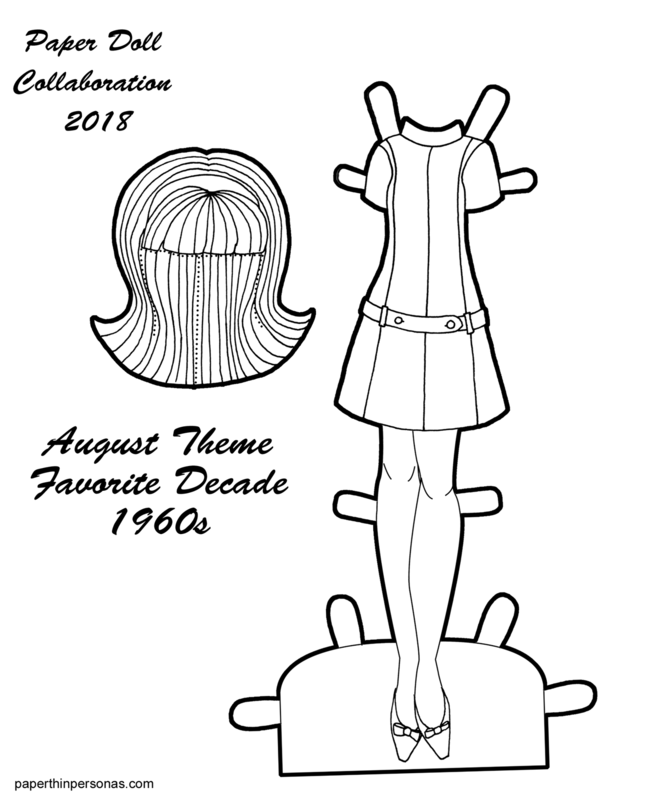 I probably still wouldn’t have, but that was the theme for this month’s Collaborative paper doll. The whole point is to break out of comfort zones, so this is certainly breaking out of mine. 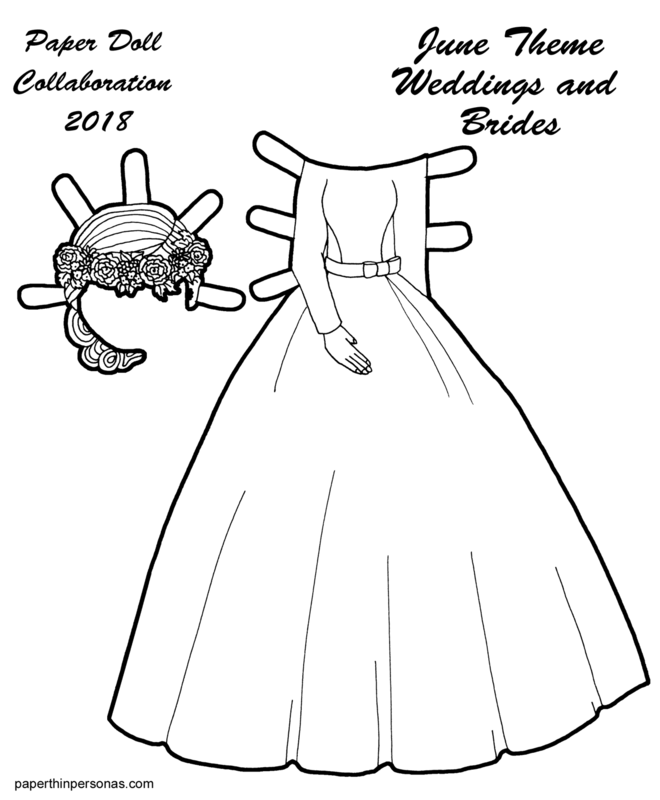 So, for this paper doll wedding dress, I knew I wanted a few specific things. I wanted a crown of flowers, as that was what my mother and my sister both wore at their weddings. Also, I wanted sleeves. Personally, I really like wedding dresses with sleeves. I didn’t want to go “modest” wedding dress (because a lot of those just look dowdy to me), but I did want sleeves. I like sleeves and I think wedding dresses shouldn’t look like a prom dress in white. They should have some elegance. If you want to see more bridal paper doll fashions, check out Paper Doll School and Miss Missy Paper Dolls my partners in this collaboration.